Upgrade with default firmware via WEB interface is not possible. Upgrade from u-boot (tftp) is not working too - because of broken ethernet configuration. Upgrade from u-boot via serial (kermit) will end with bricked router too ( verified). Below you will find the way how to bring new working u-boot and openwrt firmware at once. Default u-boot bootloader is broken - ethernet is not fully initialized, and it seems that it is protected against starting other firmware than oryginal one. Do not try to upgrade this bootloader from bootloader menu - you will brick your device ! Default firmware cannot accept openwrt images so at the beggining (after u-boot upgrade) we will load minimal openwrt firmware firmware.img . probably you will be disconnected after last command, so login via telnet again.
! Upgrade uboot - be careful, do not reset router during and after this operation !
! Upgrade firmware - do not reset router during this operation! Reboot router :), enjoy new u-boot with working ethernet and openwrt firmware. Now you can use standard openwrt upgrade procedure. You should see content, do not go further if you do not see files ! In order to have access to bootloader (u-boot) menu and functions we have to connect serial port to the router board. Pads are quite large so soldering is relatively easy.
! One problem has to be fixed - when you will connect adapter to RX in router and power on system will hangs. To fix it temporary you have first power on router and next quickly connect RX cable. 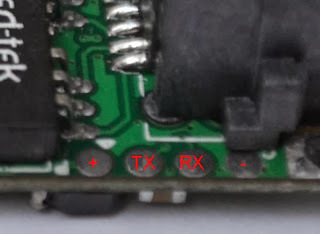 To fix this issue permamently you have connect router RX and adapter TX by resistor (470 ohm - 1k ohm). Router TX to adapter RX. and avoid if possible prolific PL2303 because of unstability ( maybe there are plenty of clones and prolific is not guilty - hard to say). When you failed with u-boot upgrade you can program SPI flash without desoldering it. You need to connect thin wires to MISO, MOSI, CLK, CS, VCC and GND. I recomend to desolder VCC pin and lift it little bit, you will solder it again after programming. Disconnecting VCC prevent and distrubances from SoC or other components. lifted VCC pin at the right corner soldered after programming. But you can use any SPI programmer which supports GigaDevice GD25Q32 or flash you currently have. I purchased the same router and when it came I plugged it to the computer and tried to set it as a wireless client. The moment I hit submit button the router died and now the only signs of life are the two red and blue diodes that burn constantly and nothing. Do you have any ideas how to bring it back to life? you have oryginal firmware ? Could you try to connect to it via telnet, what is the result ? I found your address in openwrt forum. I hope you can help me a little. I also have one of these HAME MPR-A1 clones and want to run openwrt. I have a 32MB Version and I assume that I need to update u-boot.... fine. Which firmware should I use to ensure a proper working, because all currently available images only support 16MB. Yes I'm willing to compile a version by myself, but for this I would need additional help. I hope you can help. Did you compile provided version+patch from https://github.com/JiapengLi/OpenWrt-HiLink-HLK-RM04 ? Anything else or a different approach? The description here says, that the image shall be written via "mtd_write write /mnt/firmware.img Kernel_RootFS". My router does not provide Kernel_RootFS. How can I solve this? 2. Regarding firmware I will release today or tomorrow memory independent images, so you can use them. 3. I have used path you mentioned + many little changes espetially fixes in packages. Some important for me was broken by default. I have additional scripts to generate many images at once. 4. Regarding missing Kernel_RootFS, could you send me result of "cat /proc/mtd" ? @1-3: please give me private message, when you release newer version. I can give repsonse when it works. Hi Martin images released. Working with 16 and 32m versions. Please give me a hint about writing to Kernel_RootFS. I assume "mtd_write write /mnt/firmware.img Kernel_RootFS" won' work. Any idea? and assuming that you have 4MB flash ! I would try "mtd_write write /mnt/firmware.img Kernel"
Remember to upgrade uboot first (256 version). Eventually you will have to say hello to USB2uart adapter and solder three wires. BTW. you have plenty of ram, so you do not have to kill processes by killall. So thanks for your help! According to "free" it only has access to 16MB RAM. I read somewhere that there is a mis-configuration, that can't be solved without soldering. Probably you must set a fixed size of RAM for image creation. Can you provide photos of box, and PCB ? I will update manual how to upgrade 32meg version. can you send me your email to pawel.ratanczuk at gmail ? I'm an idiot. I took the wrong file for 16MB version!!! Thanks for the tutorial. I was able to flash my router to openwrt successfully. However, afterwards I attempted enable ssh via a passwd command, and now I'm not longer able to access the router. I'm still able to ping it at 192.168.100.1. When attempting to telnet back in, I get the expected "login fail" since telnet is now disabled. However, I'm not able to SSH into it. I attempted to do a failsafe recovery, but that didn't work either. Not sure why. I do not include ssh in to images, in order to reduce size, so ... look for solder and usb to uart adapter. How about the failsafe recovery? Why isn't it working? Yeah, thanks also. Just bricked it because telnet asked to change passwd and suddenly there is no ssh. I want to upgrade my A15 router to Openwrt. Happened to me, changed usb flash and all good. I do not have access to A15. Upgrade procedure should be the same like in mentioned mini router. One issue is still open - how to download image. I have read that A15 has no ftp server nor Mass Storage support. So maybe you can check if is there in any ftp, tftp server or client or meybe wget is available. Hi! I have the same device and before I try to hack the firmware I would like to address an other problem. Is it still possible to use your instruction if mtd show a little bit different structure? Did it work out OK to just install the image above? Thanks! Can you make a simple description of your firmwares - what is inside of every one? I have published imagebuilder and scripts used to generate images. So you can take alook what is in images, you can modify scripts and ad own packages. I have not include opkg to save space. To change configuration modify ./image_builder_rt5350.sh and content of "Files" directory. I compiled openwrt, but I don't like the results with just 16MB ram. Ordered a 32MB chip and will try the ram upgrade. Did you made a backup of you original firmware on the 16Mb Ram Device? If you did can you upload it somewhere? Any advice on how I can connect via telnet ? Maybe there isn't telnet service on your device? Yes, that is what I am being led to believe. In a situation like this (i.e.no telnet ) do you have any recommendations on how I can flash it with an image of my choosing ? Heh, i have a version of this router. I can telnet in, but cannot run any commands. The busybox (msh) only has access to 5 or 6 commands. Not even cat or ls works. Any ideas ? ctrl -D just closes the telnet session. Does anyone have an "official" firmware, where Telnet works ? Hi, I tried with UART, there also I can see few commands only. And the prompt is like 'BoC Router>'. There is no root prompt. What should I do to upload u-boot? I have flashed my device and now its bricked. Is there any way to re-flash bricked device? Hi, I try to use yours ImageBuilder, but it not work. I try build mini image, and this is output from console... Plese help me, this is interesting device. Are you sure that you have taken this image bulider: https://code.google.com/p/rcc/source/browse/trunk/projects/rt5350_mini_router/OpenWrt-ImageBuilder-ramips_rt305x-for-linux-x86_64.tar.bz2 ? As far as I remember it was build with support for 32meg version. Just Tried it again, and no luck :-(. PACKAGES="$USB_SERIAL $WIFI $SSH $GPIO $I2C avrdude"
did you succeed in your project? I trying something similiar... I managed to build and flash an image but am unable to set up the wifi correctly. Maybe you can publish your config? Man, this is perfect tutorial!! Now I have to buy a that uart!! Thanks for the tutorial, great work. Man, just connect using telnet or ssh to 192.168.100.1 :), they are included. Actually I'v changed password and as stated there telnet is disabled now. When I try to connect by SSH, I get connection refused, which means either port is not open in firewall or SSH is not included in firmware (as you have mentioned in comments -> to reduce firmware size). So, only option is to use UART, right? :), now it is clear, with mini image only telnet is included, so if you had change password, look for solder and usb2uart adapter. Привет. Ребята у меня после прошивки горит красная лампочка и устройство не работает. Как реанимировать и с какой прошивкой? hello, i have an "Wireles Hard Disk" formerly known as "ALZXmate" that i have bought from aliexpress. This seems to be have very same hardware inside. I want to know if anyone could help-me to upgrade that firmware to OpenWRT. If i try and brick my device, could i unbrick via UART ? i really don't know where to start. The FEYE 3G WiFi Router are sleek in design and stylish to own. It enables the internet hub for the multi users to use it same time with high speed and great connectivity. A pocket WIFI router is a small, portable device that has inbuilt WiFi hotspot capability that easily enabled internet connectivity. FEYE Wireless SIM Slot Wi-Fi Router 1500mAh is a router that needs only a 3G activated SIM to enable the internet connectivity. By inserting the SIM, one can establish the network hub either permanently or temporarily. It allows multi users to work at a time. A FEYE Bluetooth Remote Shutter is a small device, a remote that is used to click your images via connecting with the mobile phone. The device is compatible with almost every digital device such as mobile phones, tablets, iPhone, iPad and all that has the Bluetooth connectivity option. A Bluetooth remote shutter is a small device, a remote that is used to click your images via connecting with the mobile phone. The device is compatible with almost every digital device such as mobile phones, tablets, iPhone, iPad and all that has the Bluetooth connectivity option. Could you pleae help me? Hello some days ago i bricked my router (same as your).. telnet is working but it says: Failed to login. So can i connect via Serial and flash openwrt image again? First of all - thank you very much for your work, i been able to reflash my router to the OpenWRT and make it compatible with my 4G donlge (its using cdc_ethernet). I had to build my own package, see https://gist.github.com/samm-git/0e96a99b1e407132f8fd for the changes. However then i found that package builder is compiled for the 16M version. I had to manually patch mem=16M with mem=32M to see all memory. After patch it works pretty well, i was able to put all interfaces (WWAN from dongle, ethernet and wifi) to the bridge and i got tiny openwrt 4g router. It would be great if you can accept my patch, i think i am not only person with such problem (native fw not supporting such devices at all). Also could you please tell how you created this image builder? Any local patches or tweaks? As far as I remember in buildroot is text file with description what I have made. Thank you for reply :) Was able to upgrade to 14.07 using OpenWRT sysupgrade. And after few small changes dongle works just fine with my usb ethernet modem. thanks for hint, I have just added links. BTW wher you have bought your 32M version, I ordered a few times from aliexpress byt unfortunatelly always with 16M on board ? I got mine from http://www.ebay.com/itm/311386706887?_trksid=p2060353.m2749.l2649&ssPageName=STRK%3AMEBIDX%3AIT . Now ordered 2 more, because it seems to be very good device to use in different home automation tasks. BTW, it works very stable as LTE router, using it all the day @ work now. I upgraded your versions of uboot and firmware to my mini router, than the usb stop of work and the router stop of the webserver (internal), and no wifi network by default work (no SSID). So I connect by telnet and changed the password, and lost the connection with the router. I tryed to use uart connection, I did this one time, but I break the layer RX and couldn't use uart any more. Now my only option to bring my router back is using SPI programmer. If I want to programmer using spi. What file image should use? Could you post a step by step to programmer the Flash using spi ? Considering to clear or erase everything from memory and putting all new. I appreciate your help on this matter. i have got the 16 mb version of the above router i sucessfully updated to mini firmware using your tutorial but i am not good with using router via telnet only. ftp and scp seems to be disabled so how do i upgrade to desired firmware? or how do i install luci. sysupgrade wont work either as the router is not connected to internet. how do i change firmware or revert back to old firmware? PLEASE HOW START THE WEB PAGE AND ROUTER FUNCTIONS??? I upgraded to open-wrt firmware successfully from the official firmware by uploading bin file and its running fine but only thing is this device came with 4MB Rom so I can't install more packages on it. Is there any possiblity to upgrade its 4MB ROM to 8MB or 16MB ROM?? by replacing of ROM Chip.. I have same clone for hame a1 i update with wrong firmware now its not working. I can connect through wifi only install static ip to mobile. Also not opening 192.168.169.2.please help. That's not the real IP. Have you tried 192.168.1.1 ? Link for the images are down. could you upload or share with me ? Hi, i bricked my router, used usb and flashed uboot, then noticed i had the wrong firmware on my usb stick. i put the correct firmware in it and plugged it back to the router, tried mounting it and it did not mount!!! well, i have a flasher so i can flash the spi again, but does anyone have the original package, or a working one, so i can flash it?? The GUI is pretty slow, but there are some useful cli programms you can use with from debian! I have Leoxsys L3 150N WiFi 3G/4G Router on which I cannot use or connect 4G data cards like airtel etc. can you guide how to upgrade and so, that I can use 4G data card as well. why dont we use to load firmware? i have a problem after upgrade firmware https://goo.gl/hzjK7P (image), how to fix it? Buy GSM, GPRS, 3G and 4G industrial modems for machine-to-machine and IoT applications. Thanks to share informtion with us. I am also sharing a link to get instant help in fixing the tech issue of at Cisco Router Help Number UK. Thanks, your information was .VISIT- D-link Router Helpline Number UK and also call Toll Free No 0800-090-3240. Thanks, your information. VISIT- Netgear Router Helpline Number UK and also call Toll Free No 0800-090-3240. 4G LTE Advance and Wi-Fi Router with a robust design for industrial applications. Wondering if we could load the firmware mentioned into it? amazing blog to read. Keep it up. Here is one good ways to short out your Facebook account related issues with the help of Facebook Live Chat Support. This service is also one of the best service providers. You can discuss your issues and get their solution instantly. I just read your review about Mini 4G Router - RT5350F Wireless Router but still I can't rate it as the best wireless router because I guess it will not offer best Wi-Fi range and high speed internet. Well, there are different things to consider before wireless router. If you are looking to buy a new router then you check the market for different products. If you are looking to buy a new wireless router then you should take a look at this list of wireless routers. I bet you will find the best one for your needs. Cisco always looks to help its customers by various ways. many people are facing problen in their d-link router they people can contact us we are here to provide the complete solution about the asusu router support. splendid post so thanks for this. if you have any problem related to the opera then they can contact us. Thank you very much for sharing this important information! A very good article. mozilla firefox support is the best browser for the internet surfing and provides the many facilities of the user like many tabs open at one time, add many extension, etc. If any user faces any issue and problem in the mozilla firefox support like Installation problems, version problem, etc. so you can contact our mozilla firefox customers service team. liksys router login & linksys login for best support. Nice post.. Very interesting. I really like this post..
great post....thanks for sharing useful information.. There may be some employees in your office that are using your business printer for their personal use. If one or two employees are doing so then it won’t cost you must but if a 20-30 employees are doing the same then it might cost you much. Read this blog and learn how to track print job in a better way. To know more about printer, feel free to visit: Canon Printer Technical Helpline UK. teaches you how to reset your D-Link router Wi-Fi password. If you lost the password to the admin. I am very much helped by this blog post given here I am thankful to the writer for posting this informative piece here. What a helpful technical post! I think Wireless Router is the best one to achieve uninterrupted WiFi while blogging. I had some issues with my router which I was unable to fix on my own. Then, I opt for https://mywifiextlocal.net/ website which is truly helpful in fixing all my router issues. routerlogin.net is a web portal for Netgear router setup. Go to Netgear router login page using Netgear router default IP or URL and follow the steps. us directly when feel free to call +1-800-684-5649 We provide 24X7 Help Desk support . What a helpful technical post! I think Wireless Router is the best one to achieve uninterrupted WiFi while blogging.